Sesame Seed Oil has been used as a healing oil for thousands of years and the list of benefits of sesame seed oil is long. Sesame oil is mentioned in the Vedas as excellent for humans as there are many sesame oil benefits for both health and beauty. It is naturally antibacterial for common skin pathogens, such as staphylococcus and streptococcus as well as antifungal for common skin fungi such as athlete’s foot fungus. It is naturally antiviral, and it is a natural anti-inflammatory agent. Sesame seed oil has been used extensively in India due to the many sesame oil benefits as a healing oil, including in experiments which showed it was useful in unblocking arteries. In recent experiments in Holland by Ayurvedic physicians, the oil has been used in the treatment of several chronic disease processes including Hepatitis, Diabetes and migraines. Watch this tutorial by Naturopath Sachin Goyal about a few of the many health benefits that can be enjoyed when you add sesame oil to your diet! Research shows that another one of the health benefits of Sesame seed oil is it's potent antioxidant properties. In the tissues beneath the skin, this oil will neutralize oxygen radicals. It penetrates into the skin quickly and enters the blood stream through the capillaries. Molecules of Sesame seed oil maintain good Cholesterol (HDL) and lower bad Cholesterol (LDL). Sesame seed oil benefits include its action as a cell growth regulator and slows down cell growth and replication. Thanks to magnesium and other nutrients, sesame seeds, and especially sesame oil, has been shown to combat diabetes. One of the more surprising benefits of sesame oil: In an experiment at the Maharishi International College in Fairfield, Iowa, students rinsed their mouths with Sesame oil, resulting in an 85 percent reduction in the bacteria which causes gingivitis. As nose drops sniffed back into the sinuses, Sesame seed oil has cured chronic sinusitis. As a throat gargle, it kills strep and other common cold bacteria. It helps sufferers of Psoriasis and dry skin ailments. It has been successfully used in the hair of children to kill lice infestations. It is a useful natural UV protector. And there are more benefits of sesame oil: Used after exposure to wind or sun it will calm the burns. It nourishes and feeds the scalp to control dry scalp dandruff and to kill dandruff causing bacteria. It protects the skin from the effects of chlorine in swimming pool water. Used before and after radiation treatments, Sesame seed oil helps neutralize the flood of oxygen radicals which such treatment inevitably causes. Sesame oil has been shown to lower blood pressure in hypertensive diabetics. In addition, magnesium has been shown to help lower blood pressure and sesame seeds contain significant amounts of magnesium! Sesame seeds contain an anti-cancer compound called phytate, and the magnesium contained in sesame seeds also harness anti-cancer properties. A study published in the American Journal of Clinical Nutrition found the risk of colorectal tumors decreased by 13 percent and the risk of colorectal cancer decreased by 12 percent for every 100 mg of magnesium taken in. Sesame seed oil benefits include helping joints keep their flexibility. It heals and protects areas of mild scrapes, cuts, and abrasions. There are many ways to enjoy the skin benefits of sesame seed oil and it is not known to have any kind of side effects on the skin. Sesame oil can also be mixed with other oils to increase its skin benefits. Listed below are some of the benefits of sesame oil for skin. The vitamin E in sesame oil makes it a very good emollient and moisturizer, which, if used regularly, keeps your skin moisturized, healthy, hydrated and nourished. Hence, sesame oil is known to be extremely beneficial for dry skin care. Sesame oil has natural sun block and sunscreen properties. Application of sesame seed oil on the body parts exposed to the sun can help prevent tanning and other damages caused by the harmful UV rays of the sun. This is one of the important sesame oil benefits. Sesame oil has tranquilizing and soothing properties hence it is popularly used in massage therapies and aromatherapy. A sesame oil face or head massage before going to bed can help you get some sound sleep and rest and is beneficial for people suffering from insomnia. The soothing and healing properties of sesame seed oil also prove useful in the repair of damaged skin cells and for skin rejuvenation. Application of sesame seed oil to the skin improves blood circulation which helps repair damaged skin cells and gives the skin a healthy glow. Sesame oil also seeps into the skin or is absorbed by the skin very easily, which helps skin feel soft, hydrated and light. Sesame oil has the ability to attract and trap toxins that are soluble in oil. This detoxification of the skin can be done by applying warm sesame oil to the skin, let it stay for around 15 minutes and then wash it off with lukewarm water without using any soap. Read more on facial skin care. The antioxidants that it contains helps reduce the appearance of fine lines and wrinkles and helps you maintain youthful skin for a longer time. Sesame Seed Oil helps tighten facial skin, particularly around the nose, controlling the usual enlargement of pores as skin ages chronologically. Topical application of sesame seed oil is also known to be beneficial in the treatment and cure of skin related disorders like psoriasis and eczema. Sesame oil is also very beneficial in the cure and prevention of acne due to its oil pulling properties. For children going to school, who will be in the presence of other children with Colds and sniffles, the benefits of Sesame seed oil swabbed in the nose can protect against air borne viruses and bacteria. As you have now learned, the benefits of sesame oil are wide and varied and even somewhat amazing – and no home should be without a bottle of golden, pure and incredibly useful sesame oil. You can purchase this wonderful, natural oil and reap the sesame oil benefits by clicking here. Enhancement of Composition and Oxidative Stability of Chia (Salvia hispanica L.) Seed Oil by Blending with Specialty Oils. Where can a person buy sesame seed oil to use for sinusitis? seseame seed oil available at whole food very cheap..do not buy from interent…16 oz container is about $5 from any middle eastern grocary store or at whole foods…i grew up in the middle east and i remeber when i had any problem with my skin such as a burn or a cut my mother applied the seseame seed oil on it and healed like magic! nothing like ancient medicine. Will it also helped to cure GOUT (chronic arthritis)??? thank you so much. will it also helped cure GOUT (chronic arthritis)??? Thank you. hi…is sesame oil bebeficial in hyperpigmentation too??? I wonder what benefits other oils have when used in unconventional ways. Apparently Castor oil has a lot of healing properties. Anyone else know what I’m talking about? .-= Jim C´s last blog ..Highlights from an interview with Neale Donald Walsch =-. Sesame oil helps with various problems. It helps also with dry and damaged hair without shine. Apply a few drops of oil and wait 5 to 10 minutes, then wash out with shampoo. The hair will be shiny and healthier. .-= Susanne@Human Hair Weave´s last blog ..Curly Weave Hairstyles =-. Very interesting findings! I will have do go get some Sesame oil and try this out. hi….I have chronic sinusitis for 20 years and have never found anything to cure it. Ive recently started doing Oil Pulling with Sunflower Oil and while it has helped a lot it has not cured it . I noticed the site mentioned about Sesame Oil drops in your nostrils,,and was wondering how many drops and how many times a day should one try??? 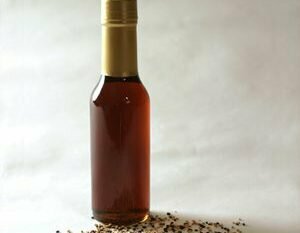 Best to purchase organic sesame oil in a glass container. Newest 2011 research shows that plastic, even BPA bisphenol A free plastic shows estrogenic activity…meaning the plastics leach out ingredients that behavior like the hormone, estrogen. So using oils in plastic containers may possibly be contaminated with a hormone disruptor like BPA or some other ingredient that also acts like estrogen. Look Up Dr. Bittner’s research to confirm. He tested over 400 plastic items that are everyday items and found EA estrogenic activity in 70 percent of them; once the plastic was “put under stress” meaning used, washing out and reused, heated as in microwave, the BPA or some other ingredient in the plastic like BPA shed off the plastic. Glass would be the very best for all the oils you use. Sorry I didn’t finish, once the plastic was put under stress, over 95 percent of the plastic tested showed EA estrogenic activity. Even BPA free containers. I had a very bad case of peri-oral dermatitis and it was causing me all kinds of grief! I was constantly trying to wash off, scrape off, and “moisturize off” the rough, hard, and very flakey dry skin. My rheumatologist told me about sesame oil, and after doing extensive research online, I started using it for a number of things in addition to cooking with it, and the results have been amazing. The dermatitis is completely under control, and the rest of my facial skin is very smooth and supple. In addition to cooking with it, I also started messaging it into my skin, taking extra time to rub it into my larger joints. My joint tenderness has decreased by a great degree. I am starting to use the oil for oil pulling, but I realize any good effects will take time to show up. I am completely SOLD on sesame oil. Be sure to use the light sesame oil, and if possible, buy organic! We use sesame oil for different purposes. It’s good for our hair as it helps us to prevent damages and keeps it shiny and smooth. I always consider products with sesame oil.